If you are searching for a professional to take care of your Fayetteville sod installation, you have come to the right place. Since 2007, our Fayetteville landscaping company has been the name that locals rely on for this and other important outdoor environment enhancements. We take this line of work seriously and it shows in the results that we are able to deliver to each and every client, each and every time. Opting to work with sod is a smart decision to make; it will help you get the perfect, lush green lawn you have always wanted but without the work that is involved with overseeding. While there is some care and maintenance that goes into making sure the roots take hold and that developing sod gets the water needed, it is more of an immediate results process – when compared to other options. So give us a call today and let’s discuss the process with you to be able to give you the yard you have always wanted. There are actually quite a few benefits of sod that you may not even yet know about. For one thing, sod helps to conserve water and will also aid in the prevention of soil erosion. This approach also helps to replenish ground water but also manages to act as a natural filtration system purifying the water passing on to the root zone. And what you may really appreciate is that it reduces the likelihood of pests, snakes, insects and rodents. 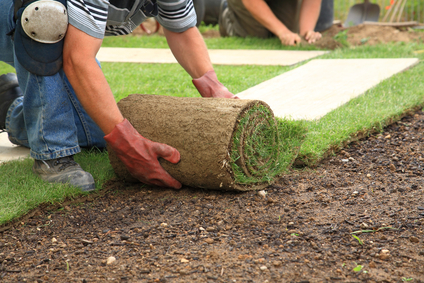 While sod installation may come with a higher price tag, the end results are well worth it. Seeding can lead to spottiness and patches of exposed soil, which does not deliver the final look you want. You can have sod installed just about any time of year, even when the ground is not thawed, unlike seeding which should only be done in fall or possibly spring but without the perfect conditions may not work out. Get in touch with us now and let’s review the options that you have and help ensure that you get the quality results that you want. As a a locally owned, small business, we are focused on being able to provide the best in quality service to every customer we work with. We have the professionalism and reliability of a corporate business with the personalized care and attention that you can only get with a small business. 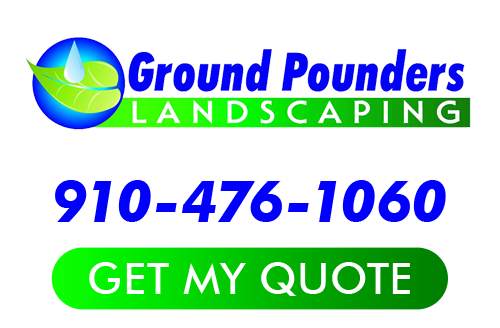 When it comes to your Fayetteville sod installation crew, Ground Pounders Landscaping is the only name that you need to know. So give us a call today to find out more about what we can do for you. If you are looking for a Fayetteville Sod Installation expert then please call 910-476-1060 or complete our online request form.